The ECAC released its preseason polls today and coming off a 9th place finish in the 2017-2018 season, the love was not there for Quinnipiac in either the media or coaches poll. The Bobcats were picked to finish 8th in the media poll and 7th in the coaches poll coming off the programs first losing season since 1995-1996. This was the first year I had a ballot for the media poll and I ended up picking Quinnipiac 5th. The offense should be much better with an influx of talented freshman up front that will help support returning leading scorer Odeen Tufto (41 points) and leading goal scorer Alex Whelan (16 goals). The defense returns four upperclassmen and goaltenders Andrew Shortridge and Keith Petruzzelli should be better this season. Quinnipiac opens the season with an exhibition game against Prince Edward Island on October 6th before kicking off the regular season on October 13th at Vermont. Here is the media and coaches polls in full. Quinnipiac has dove back into New Jersey Hitmen pipeline with the commitment of 2001 born forward Liam McLinskey a native of Pearl River, New York. The Bobcats have done well with Hitmen players in the past with notables Connor Clifton, Tim Clifton and Alex Whelan having been key players for the Bobcats. McLinskey is a 6'1, 161 pound forward who currently plays for the U-18 Hitmen team where he has 3 points (1 goal, 2 assists) in 3 games played so far this season. He is coming off a strong U-16 season in 2017-2018 in which he had 55 points (16 goals, 39 assists) in 31 games played with 17 points coming by way of the power play. McLinskey also played for Don Bosco Prep the past three years and had 21 points a season ago on 10 goals and 11 assists. He will once again be part of Don Bosco's team this winter as the captain of the team. 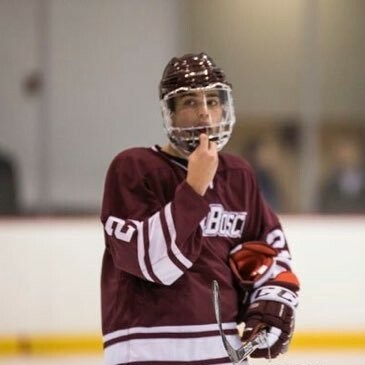 He will likely head to juniors following Don Bosco for at least a season or two for more seasoning before arriving at Quinnipiac. Congrats to Liam and welcome to Bobcat Nation.